Bonjour et... thank you for visiting my website! 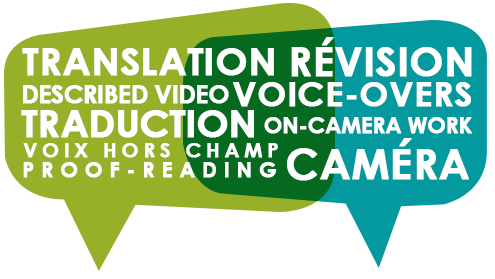 Do you have some French translation needs for marketing materials, a documentary, an ad, communications or something else? Maybe you are looking for a female voice-over talent to narrate your next video or make that radio/web ad come alive... or perhaps you are preparing a training video and are looking for an on-camera bilingual talent. Click on one of the tabs above and let’s start a conversation to find a solution to your needs. Can't play the demo? Download here. I love working in Dundas, but frequently hit the road (as my yearly mileage indicates) to record at studios in Toronto, Hamilton, Mississauga, Kitchener-Waterloo, Burlington, Niagara or another Golden Horseshoe city. I can also record and edit from home, depending on your needs. My voice is energetic and smiley, however it can also be serious, authoritative without being harsh, young and bright, sensual... Best to just listen to the demo above! Corporate narrations, e-learning modules, TV/radio ads, PSAs, on-hold messaging, corporate voicemail systems, in-flight and in-store voice announcements, books, documentaries, described video and more, I’ve done them all, with/without English audio playing in my earphones, for dubbing or timing purposes. I particularly enjoy the challenge of making French content fit into the same time requirements as its English original version (translated French is typically 30% longer than English). My professional French voice-over career started in 2003, when Mike “Michel” McCurlie (MJM Studios in Hamilton) took me under his wing - my experience has broadened since and I now also produce/direct, revise scripts for content and timing, and prepare audio capsules through storytelling. In 2007, as a natural extension of my voice-over work, I started to do some on-camera gigs. My extensive experience in teaching, coaching and training prepared me well for this and after a few contracts, I quickly realized that I love doing either improv, which I did as a host for the short-lived teleshopping.ca show, or teleprompter-reading, for projects such as corporate narrations, e-learning modules and TV show hosting. In addition, clients can benefit from script revisions (on the fly or in advance) and behind-the-camera work. The logos on this page are only a few samples of well-known clients who have used my on-camera services through the years. I’ve had the good fortune to work on fabulous projects for clients such as the Ministry of Education of Ontario (here is one sample project: 21st Century Teaching and Learning), Learning Disabilities Association of Ontario (LDAO) and Best Start (Health Nexus - healthy baby, healthy brain). These journalistic-type projects, where it’s all about capturing the moment as it happens then working the content into a compelling and memorable story, were done numerous times with Mediaface and MJM Studios. This is where it all started over two decades ago. Some translation contracts here and there for marketing and communications materials evolved into so much more years later, first when doing translation/proofreading at GE Appliances (apparently part of my job, along with voice-overs!) then when I launched my own business while pursuing my Masters studies. My translations fees are affordable and based on a word count from your source documents. Fees include research, translation, proofreading and 2 minor client changes within 30 days. They also include free pre-press proofreading for all French translations performed by me to ensure your published material is printed exactly as you had envisioned it. All materials are treated with utmost confidentiality. Turnaround is usually 3-5 days for translations less than 5 000 words, to be determined for larger documents. I would like to highlight that I offer personalized services – I am a human translator and do not use a spotty software! These services may include cultural adaptation recommendations based on my French Canadian background and French graduate studies, as well as decades of corporate experience in sales, marketing and entrepreneurship. I am more than a translation service provider, I am your business partner to ensure your message is communicated clearly and appropriately in its wider context. Born and raised in the Montréal area, I have been a proud Hamilton-based French Canadian Franco-Ontarienne since 1996 (and a wishful Hawaiian too for the past 5 years!). After obtaining my B.Comm. in marketing, I worked 10 years in sales & marketing, mostly for GE Appliances, then decided to become a corporate drop-out in 2003 to pursue one of my passions: French language and culture. Hence that same year, I started my full-time French voice-over and translation career while pursuing full-time graduate studies in French, with some personal training and group exercise coaching on the side (fitness/wellness is my other passion). Busy times, to say the least, as I grew my business to the point where I incorporated it in 2014. What’s next? Ask me about my PhD and my 2nd published cookbook in 2018! I am particularly proud of having published a cookbook in 2014, which was featured in a segment on CHCH TV Morning Live in June 2015 - a special shout-out here to my friend and business partner Dana Dobbie on this particular feat, which happened a few months after I suffered a major concussion. Without her, that book would still be in my computer and my head. Dana is also the design brains behind this website. If you like what you see, don’t hesitate to contact her. Apart from being obsessed with healthy, allergen-free home-cooked meals, I enjoy eating bags of organic MacIntosh apples from Georgian Bay or Québec, exploring nature trails, swing dancing, geeking out on eco living with my husband and swimming with wild dolphins in Hawaii. The relationships built over a decade of offering various French services in Ontario to a variety of clients have been truly rewarding and fun. 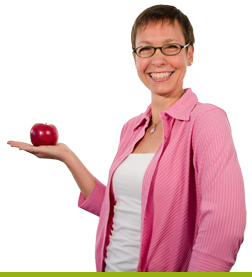 "Hélène has been a model service provider for our busy company. We do a lot of French work here and she’s helped with translating, voicing and producing our French commercials and videos. She’s always very responsive, even if she’s busy. For instance, last week we needed a translation done fast, as the client and talent were in the studio, but the client had forgotten to do the translation. Hélène was in her car travelling to another session when we called. Being in a bind, she helped us out on the fly, literally! She translated the :30 second spot on the spot. Hélène is helpful and ready to spring into action just about anytime. Her enthusiasm and positive attitude are always a welcome addition to our sessions, and she’s great at conversing with clients in French to help solve their issues. We’ve been using her services close to 20 years now, and we’ll definitely be continuing to hire her when needed. I highly recommend her!" "MediaFace crafts authentic stories that connect you to your key audience. Hélène has been an important part of our storytelling journey since 2011. She helps our clients to make sure the French-language stories aren't just technically accurate but are culturally relevant. As video is our most requested medium, Hélène has worked extensively behind the scenes as a producer and writer developing original French-language content. When script translation is necessary, she takes great care to make sure the interpretation is accurate. You can also hear her lovely voice-over work in many of our videos." "Je connais Hélène depuis 20 ans et j’ai eu la chance de travailler avec elle pendant plus de 10 ans. Ce qui la caractérise est sa passion pour les langues et la littérature française, sa curiosité et sa détermination. Toutes ces qualités font qu’Hélène ne se contente pas d’un travail médiocre, elle va prendre le temps de faire toutes les recherches nécessaires afin de mener son projet à un niveau supérieur." "Hélène est une personne aux mille et un talents et a un don pour chacun d’entre eux!Elle fait preuve d’un professionnalisme et d’un souci du détail sans faille dans tous ses projets.Je la connais en tant qu’excellente animatrice et intervieweuse de l’émission French Toast sur les ondes de CFMU 93,3 FM et en tant qu’instigatrice du projet www.hamiltonenfrancais.ca, mais je ne peux que la recommander pour tous vos projets d’entreprise! Hélène has a thousand and one talents, and a gift for each one of them! She shows outstanding professionalism and a great attention to detail in all her projects. I know her as an excellent host and interviewer on the French Toast radio show on CFMU 93.3FM, and as the person who kick-started the www.hamiltonenfrancais.ca project. Yet I would definitely recommend this francophone extraordinaire for all your corporate projects!" "Hélène is one of my go-to describers. I can count on her to 'voice' with very little direction, in French and English. Her enunciation and tone complement the work we do. She can also deliver a cold read as though she has studied the script for days!" "Some people have a natural talent for language, others have worked hard at educating themselves, others still understand timing, cadence, and presentation. Hélène has it all, and her positive attitude makes her a pleasure to work with." A few words on confidentiality: invasive tactics like untimely marketing calls, unapproved sollicitation, spam and the like have no place in this world (take it from a marketing drop-out!). I value your privacy as highly as mine. As such, your private information will never be shared with a third party without your authorization and any material sent to me will be treated with utmost confidentiality. Why make life simple when we can cram all sorts of fun stuff in 100 years? Yes, a radio show in French in Hamilton, because there are over 45 000 people in the area who have indicated that they are bilingual (can speak French and English). I created the show in 2010 and have been the main host ever since, featuring music, cultural announcements and interviews with people from all walks of life. You can hear the :30 bilingual promo spot prepared for the show in 2015 and currently being aired on CFMU 93.3FM. Hélène Caron © 2015. All Rights Reserved.